Brett is the Founder/Chairman of the Board of mCORE, Brett earned his degree from The Ohio State University and has over 15 years in the cardiac industry. Brett was the Area Business Manager at St. Jude Medical, a medical technology company headquartered in Austin, Texas. 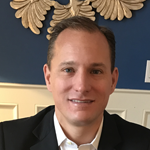 Prior to joining St. Jude Medical, Brett was also the Co-Founder and President of Healthy Life Screening, a company that specialized in preventative screenings specializing in Sudden Cardiac Death, Abdominal Aortic Aneurysms, Peripheral Vascular Disease, and Carotid Arteries. For Brett, mCORE is a personal journey as he lost a relative to Sudden Cardiac death at the age of 15. Brett knew that there were ways that this could be prevented and set out to find a way to make heart screenings accessible and cost effective. He resides in New Albany, Ohio with his wife and two children.